Police & Thieves is a Roots Reggae classic by Junior Murvin originally released in 1977 which was produced by Lee "Scratch" Perry (who also wrote or co-wrote many of the songs) at his legendary Black Ark Studios with The Upsetters. 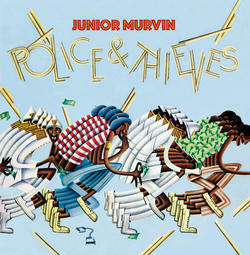 The title song was memorably covered by The Clash in a very different arrangement than Murvin's. Perry's imaginative and groundbreaking production surrounded Junior's falsetto vocals and the musicians in a dense, echo heavy, spaced out sound to create one of the great songs, and albums, of the roots era. Now available on opaque blue vinyl! Record stampers produced by Record Technology, Inc. Camarillo California, USA.